OMG Posters! 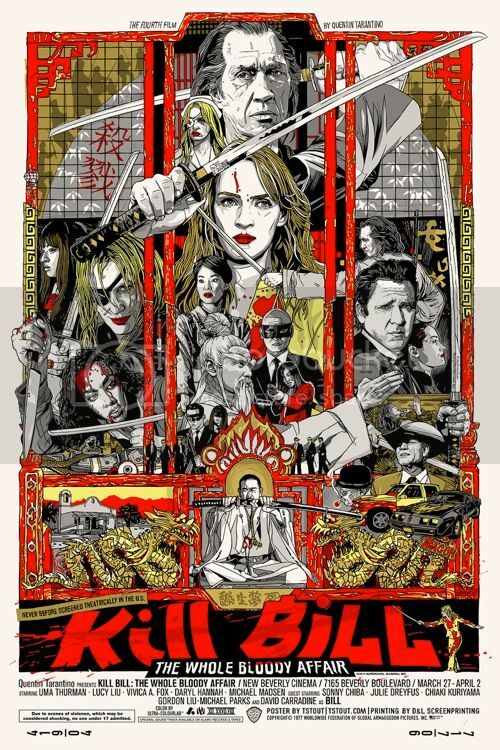 » Archive Tyler Stout's Kill Bill Lottery (And A Brand New Print NOW) - OMG Posters! 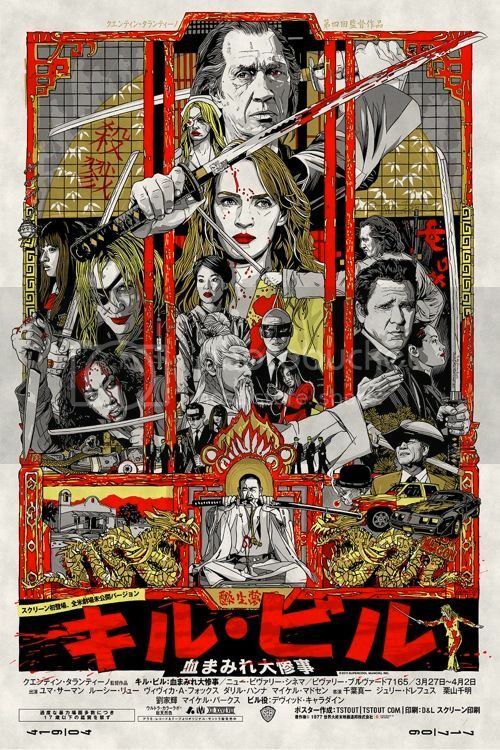 Tyler Stout is currently selling a brand new print, plus holding a lottery for his Kill Bill poster. “Nihil Novi” is a 12″ x 24″ screenprint, has an edition of 500, and costs $30. All of the info on the Kill Bill lottery (which ends tomorrow (Friday) at 3pm Pacific Time) has been laid out as well. Visit Tyler’s blog. Still have my fingers crossed that I’ll receive one of those late e-mails. Really love this poster/movie. This is what I don’t understand with the whole print business…. Would the 500 people who were lucky enough to get this, not be interested in the print it if the edition size was 1000, or 1500? If 500 sold out so quickly, why not print another batch of 500? This whole print business smacks of elitism to me. im really happy that i got regular! now just wait to it arrive. Really hate that hipster elitism with mondo. Even if i would be there on time still it isnt possible to get anything from that site, it lags just too much when everyone tries to get on freaking poster. So, let me get this straight…because Mondo is popular enough that it’s hard to buy stuff during onsale, that makes them hipster elitists? No, producing limited quantities of something that is in high demand, thus forcing a large number of their fans and customers to miss out on is. Why not produce larger edition sizes? Because then everyone that wants one will be able to get one without paying a ridiculous amount on ebay? Then the inflated prices we are seeing on ebay will go down, thus making it look like the product is no longer in as high a demand as before, even if each print still sells as much, if not more than the paltry edition sizes we are seeing at the moment? I love love love everything Mondo puts out, but not being able to buy a friggin’ art print unless I stay up until 3am (here in Australia) is ridiculous. I don’t understand the concept behind it. Wow, I guess I DO understand the concept behind it! Just have to agree with this Australian guy even if that timezone issues not bad with me here in Finland. But maybe if those things would come on sell on midnight or later( on my timezone) it would be better for me cause then i would not miss stuff cause of some other activities. Sorry for my whining but if they would like to be a bit more fair with all this stuff then all of their posters would come out with this kinda lottery. Then it would not matter if you can press F5 hardest, if you live around the world and latencey is killing your change or if you dont get pushed sms to your mobile from twitter or something else like that…. Or if they would just raise edition sizes. But these thing arent cool to them. People who live in Austin, near Austin or states are more privileged for every release than rest of us. Sorry. Sorry if ‘hipster elitism’ was too harsh. But stuff like doing vHS release is just stupid in all levels. Or like now people are again releasing more stuff on other dead formats like Compact Cassette. I just cannot wait when betamax, laserdisc and fourtrack make their comeback. And that really is the hipster thing IMHO. These were “AP” copies of Kill Bill, correct? I’d much rather him release these for more to make up revenue that he has sacrificed in limiting the run to 500. This way the buyer also has some added value in an AP copy instead of the regular run decreasing in value by adding another 500/1000 copies. Win, win IMHO…it is ART after all. P.s. You don’t think us East Coast people complain about London, Los Angeles, Austin & Paris getting all the cool openings??? At least we have NYC while you people have Australia & Amsterdam!!! Everyone will always complain forever, throughout the history of time. I think lotteries are a great idea. Everyone has an equal chance and it would not give the “flippers” as much chance to screw everyone over. Not sure what your last post is about pal. Didn’t make much sense to me.